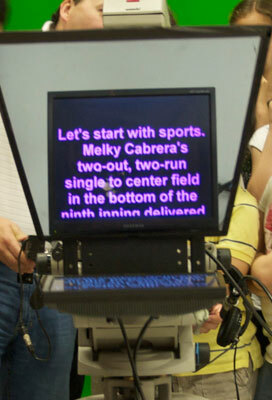 Simply put, a teleprompter is a device that "prompts" the person speaking with a visual text of a speech or script. This allows the talent to read the text word-for-word, ensuring a consistent, accurate, and polished performance while maintaining spontaneity. This benefits the performance and usually requires less takes. We have units for all of our pedestal-mounted cameras, including the jib. In addition to the camera-mounted units, we also utilize off-camera prompters as well. This allows for talent to appear to be looking at each other, while maintaining the ability to read their lines. Positioned in a visual eye-line, slightly to one side of the opposing talent, you'd never know that they weren't looking directly at each other. To make it less confusing, each actor's lines can be color-coded. This makes it much easier to know when your lines are coming up so as not to begin reading the wrong lines. Size can be increased depending on the talent's eyesight and how far from the prompter they are positioned. Generally we like to keep the fonts larger to prevent darting eyes from being seen. Many people can read the three or four word on each line using peripheral vision, giving a professional and convincing performance. 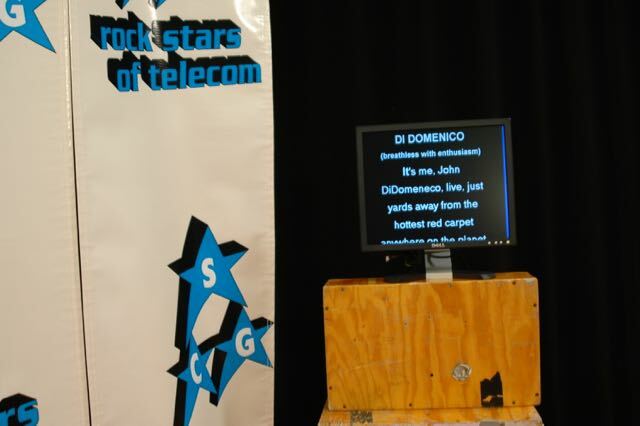 Our prompters can be used in our studios or on location. Wikipedia has a great article on the history of the teleprompter if you'd like to learn more. What the talent sees in the teleprompter glass. Off-screen teleprompter for when the talent is not looking into a camera.